Who's more worthy of hosting Say Yes to the Dress UK than David Emanuel, designer of Diana, Princess of Wales' iconic wedding dress? So you're going to be the leading man on the UK series, what made you say 'yes' to hosting Say Yes to the Dress? I love a challenge and I love the show! It's exciting and as a viewer you can learn a lot from it. I'm doing the British version and if you listen to what I say, there's a reason why I'm saying it. Of course, brides want to have fun but I'll throw in tons of what I call 'bouquets' – I'll tell you it looks fabulous, if I truly believe it does, but I'll even say 'it's not working, I think we should try something else.' I've got to be brutally honest. How does it feel to be a part of the bride's special moment when they find the one? The brides I've met so far are a bit nervous and I can see now why they bring an entourage, because they're exposed and they want back up. But I'm trying to encourage them to make their own decision – I can help and advise but ultimately they've got to feel great on the day. 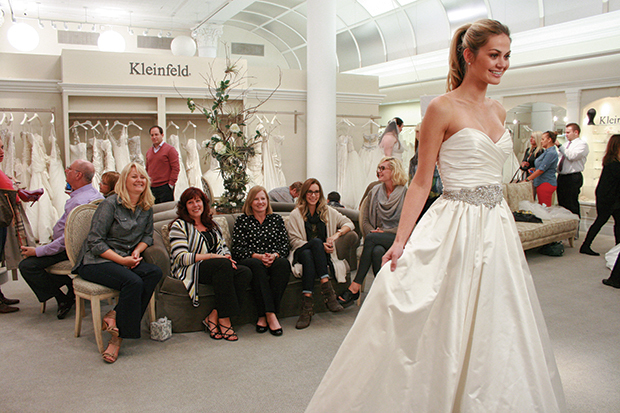 What's your advice to brides receiving differing opinions about a dress? Keep an open mind and trust your instinct. How will you deal with disputes and disagreements on the show? Calmly, and discuss the positives as well as the negatives. If you had one single piece of advice to give brides-to-be looking for their dream dress, what would it be? Try it on! It might look fabulous on the hanger but not on you. If the bride has no idea at all, that's a challenge, but equally if the bride comes with a set mind, it's tricky because it might not work – not everybody's got a fishtail figure. What's the most frequent mistake a bride makes when choosing their dress? Overdoing it on the day – they overdo their make-up, their hair, the dress. It depends who the bride is, the location of the wedding and the mood of the day, and I always think it's wrong if she's shy and retiring but has a bling dress, because it's not her. You've got to really be objective, which is hard, but don't opt for a gown because it's fashionable, put it on because it really suits you and you feel comfortable. Having designed the renowned wedding dress of Princess Diana, whose wedding dress do you think has been as iconic since? That's a very good question; I've never been asked that before! Any wedding gown designed by the wonderful couturier Valentino. Would you design Princess Diana's dress any differently now? No, I think it was right for the occasion, it suited her and we have to remember it was more than 30 years ago. Which royal or A-list star would you love to design a wedding gown for? I've always said Her Majesty the Queen, I know she's 90 but I'd love to. Meryl Streep would be another but she's married. Charlize Theron, now she would be heaven to design for. I know exactly what I'd put her in, but I'd need to meet her first because she might have a very different attitude. What's your favourite bridalwear trend of the moment? There's not one trend – it's got to suit the bride and suit the occasion. If you're marrying in a cathedral or a church it's got to have formality but equally I love soft chiffon that blows in the breeze, finished with spring flowers in the bride's hair. For brides wanting a timeless look, what design elements should they opt for? Simplicity. If you have a simple gown, you won't be able to date your dress when looking back on pictures in years to come. With more and more brides steering away from traditional white dresses, which colour palettes are you a fan of? Pale peach and pale pink – you don't have to stick to white. However, the most flattering colour for most brides is ivory because it's soft against English skin but if you've got a different skin colour, white looks sensational. Separates have shot up the style rankings recently, are you a fan? Yes, they're so versatile. I love the idea that you can remove an element to create a different look and wear it for other occasions too – there's lots you can do. What do you think about post-wedding 'trash the dress' photo shoots? I don't like them; it's such a waste of a dress. If you really don't want it, for whatever reason, then give it to a charity shop. Is having two dresses for the big day a good idea? I remember doing Jane Seymour's wedding gown in Los Angeles. She wore a peach lace dress with an organza skirt and for the evening she whipped it off into a short little cocktail dress so she could dance. Diana had a 25ft train that was detachable – it's got to be practical. I like the idea, if you want one gown for the ceremony and want to change for dinner, why not? If you can afford it – great!